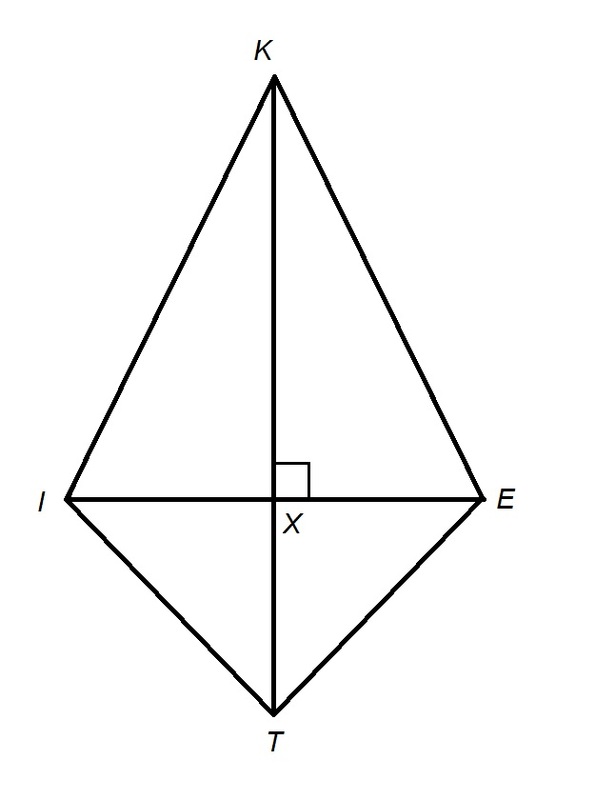 The area of the rectangle is , what is the area of the kite? The area of a kite is half the product of the diagonals. 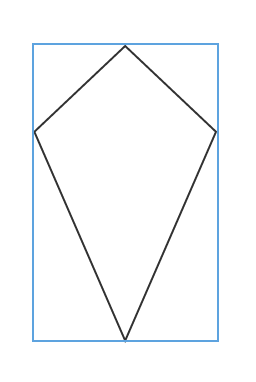 The diagonals of the kite are the height and width of the rectangle it is superimposed in, and we know that because the area of a rectangle is base times height. Thus,, the area of the kite is . Given: Quadrilateral such that , , , is a right angle, and diagonal has length 24. Give the length of diagonal . None of the other responses is correct. The Quadrilateral is shown below with its diagonals and . Using the kite shown above, find the length of the red (vertical) diagonal. In order to solve this problem, first observe that the red diagonal line divides the kite into two triangles that each have side lengths of and Notice, the hypotenuse of the interior triangle is the red diagonal. Therefore, use the Pythagorean theorem: , where the length of the red diagonal. A kite has two perpendicular interior diagonals. One diagonal is twice the length of the other diagonal. The total area of the kite is . Find the length of each interior diagonal. Therefore, it is necessary to plug the provided information into the area formula. Diagonal is represented by and diagonal . A kite has two perpendicular interior diagonals. One diagonal has a measurement of and the area of the kite is . Find the length of the other interior diagonal. Since this question provides the area of the kite and length of one diagonal, plug that information into the equation to solve for the missing diagonal. A kite has two perpendicular interior diagonals. One diagonal has a measurement of and the area of the kite is . Find the sum of the two perpendicular interior diagonals. First find the length of the missing diagonal before you can find the sum of the two perpendicular diagonals. This question provides the area of the kite and length of one diagonal, plug that information into the equation to solve for the missing diagonal. You must find the length of the missing diagonal before you can find the sum of the two perpendicular diagonals. The area of the kite shown above is and the red diagonal has a length of . Find the length of the black (horizontal) diagonal. Florida International University, Bachelor of Science, Social Work. Capella University, Doctor of Science, Social Work.